NEW YORK (CNS) — One difference between Stephen Colbert’s profile on Comedy Central and on CBS was encapsulated in an exchange he had in October with HBO talk show host Bill Maher. “I thought you were a practicing Catholic,” Maher said. Colbert’s inheritance of “The Late Show” from David Letterman the month before — one of 2015’s landmark TV events — generated considerable interest as well as speculation. Among the many questions posed by the shift was whether, appearing as himself and not as his highly successful parody of a moral scold, Colbert would continue his notable forays into Catholic expression. This, after all, is a performer who once recited the entire Nicene Creed just to make a comedic point. While hosting “The Colbert Report,” he also upheld the inerrancy of Scripture during an interview with Bart Ehrman, author of “Jesus, Interrupted.” And when writer Garry Wills stopped by to promote his 2013 book, “Why Priests? A Failed Tradition,” Colbert put up a spirited defense of the core Catholic doctrines — including the real presence of Jesus in the Eucharist — that Wills repudiates. As one of four Catholic-born late-night hosts — along with Jimmy Kimmel, Conan O’Brien and Jimmy Fallon — Colbert is hardly the first to mine his upbringing for laughs. Years ago, O’Brien, who also frequently mentions his background, even performed a routine that had him quoting canon law. 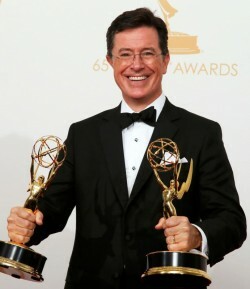 But Colbert, a former CCD instructor, is the first to make Catholic belief the wellspring of his satire. It’s the serious weight that gives some of his most telling observations their heft. And his ascent to a storied network post has done nothing, fundamentally, to alter that fact. Yet his religious perspective seems to have done nothing — so far — to broaden Colbert’s viewership. In October, a Hollywood Reporter poll showed that Colbert’s audience skewed toward highly educated, wealthy males, 30 percent of whom identified as atheists. The lion’s share of viewers who identify as Catholic — 41 percent — watch Kimmel on ABC. Of Colbert’s viewers, 47 percent identified as Democrats. Kimmel’s audience has the most political balance — 34 percent Democrats, 33 percent Republicans. Though some conservative commentators jumped on the “liberal” label as the cause of Colbert’s weak ratings, he defies easy categorization. Not only did Colbert effortlessly slip in a reference to the Letter of James — specifically, Chapter 4, Verse 10 of James — but he twinned it with the essence of “Pascal’s Wager” from 17th-century French philosopher Blaise Pascal: Conduct yourself as if God exists. If there turns out to be no God, then the loss is relatively minimal; if God does exist, though, the loss would be infinite — but so would the reward. A routine that may become difficult to sustain, “Stephen Colbert Gets All Up in Your Faith,” has taken lighthearted looks at the First Church of Cannabis in Indianapolis, and the Dalai Lama’s announcement that he may be the last Dalai Lama of Tibetan Buddhism. Colbert returned to the Gospel of Matthew when skewering former Florida Gov. Jeb Bush in November over the Republican’s assertion — during his since-abandoned presidential bid — that only Christian refugees from Syria should be allowed into the United States. Jensen reviews movies for Catholic News Service.